The Semacon Series Heavy Duty Manual and Electric/Manual Coin Counters offer high speed, accuracy and portability in a durable, compact design. The S-15 is a manual coin counter with bagging functions. It is used for portable or stationary applications. Call for a FREE 7-day demo evaluation! The Semacon Series Heavy Duty Manual and Electric/Manual Coin Counters offer high speed, accuracy and portability in a durable, compact design.The S-25 is a manual coin counter with bagging and packaging/wrapping functions. It comes with 6 batch settings for packaging and is used for portable or stationary applications. Call for a FREE 7-day demo evaluation! The Semacon S-45 Series Heavy Duty Manual and Electric/Manual Coin Counters offer high speed, accuracy and portability in a durable, compact design. Call for a FREE 7-day demo evaluation! The Semacon S-45 Series Heavy Duty Manual and Electric/Manual Coin Counters offer high speed, accuracy and portability in a durable, compact design. The S-45 is an electric or manual coin counter with bagging and packaging/wrapping functions. It comes with 6 batch settings for packaging, and it is designed for portable or stationary applications. Offsorter function separates coins by size. Available in 110 volt or 220 volt models. Call for a FREE 7-day demo evaluation! Semacon S-120 TableTop Portable Electric Coin Counter with batching/ packaging/ offsorter features an offsort function that separates large coins from smaller ones. With its exceptional durability, the S-120 counts up to 2,000 coins per minute. Call for a FREE 7-day demo evaluation! Semacon S-140 TableTop Electric Coin Counter with batching/packaging/offsorter and a large hopper features ultra-high speed at a much quieter sound level than other brands. With its exceptional durability, the S-140 counts up to 1.800 coins per minute. Call for a FREE 7-day demo evaluation! The CM-75 makes perfect closing seals to the open end of pre-crimped or flat style coin wrappers in just 2 to 3 seconds-- dramatically reducing the time it take to manage and prepare package coins. Unit only. Crimp heads sold seperately. The Semacon S-500 Series Heavy Duty Mixed Coin Sorter and Value Counter offers intelligent cash management for all five U.S. coin denominations in a durable compact design. Sorts mixed US penny, nickel, dime, quarter and dollar coins. Displays count and dollar value for each denomination and total value. Cent Crimp Head for Semacon CM-75 Coin Wrapper Crimping System. Transline carries modern U.S. coin crimp heads, but we can other sizes from the manufacturer. The Semacon CM-75 System was wholly made in the USA. Nickel Crimp Head for Semacon CM-75 Coin Wrapper Crimping System. Transline carries modern U.S. coin crimp heads, but we can other sizes from the manufacturer. The Semacon CM-75 System was wholly made in the USA. Dime Crimp Head for Semacon CM-75 Coin Wrapper Crimping System. Transline carries modern U.S. coin crimp heads, but we can other sizes from the manufacturer. The Semacon CM-75 System was wholly made in the USA. Quarter Crimp Head for Semacon CM-75 Coin Wrapper Crimping System. 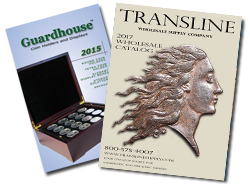 Transline carries modern U.S. coin crimp heads, but we can other sizes from the manufacturer. The Semacon CM-75 System was wholly made in the USA. Half Dollar Crimp Head for Semacon CM-75 Coin Wrapper Crimping System. Transline carries modern U.S. coin crimp heads, but we can other sizes from the manufacturer. The Semacon CM-75 System was wholly made in the USA.